It used to be professional courtesy among editors to NOT name a rival publication or station when the rival is accused of being unprofessional, like misreporting or slander, unless it has already become a court case. 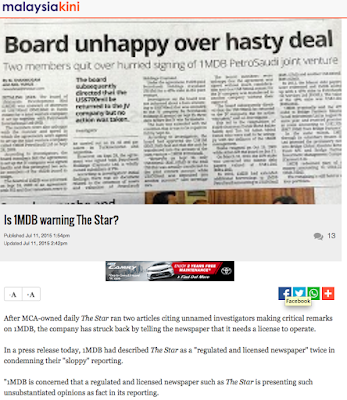 Not anymore, judging by how the three major online portals reported on 1MDB's displeasure witih The Star. And I think this - calling a spade a spade - is refreshing, for a change. In the good old days, when Tun Dr Mahathir Mohamad was Prime Minister, there was no room for sloppy reporting. Not because editors back then were better or were more afraid of the PM but because they would be kept in the loop by the authorities all the time. During the double crises of 98 (Anwar Ibrahim's sacking and the Asian financial crisis), for example, Dr M personally conducted briefings for editors thorughout the crises in order to ensure that everyone was on the same page as he. Today, it would seem, the Press are left to their own devices. Well, most of them, that is. And that is not always good. 1MDB notes with concern a number of articles relating to 1MDB published in The Star newspaper today. In particular, The Star has made a number of assertions based on the opinions of an unnamed "investigator", with reference to certain transactions undertaken by 1MDB. 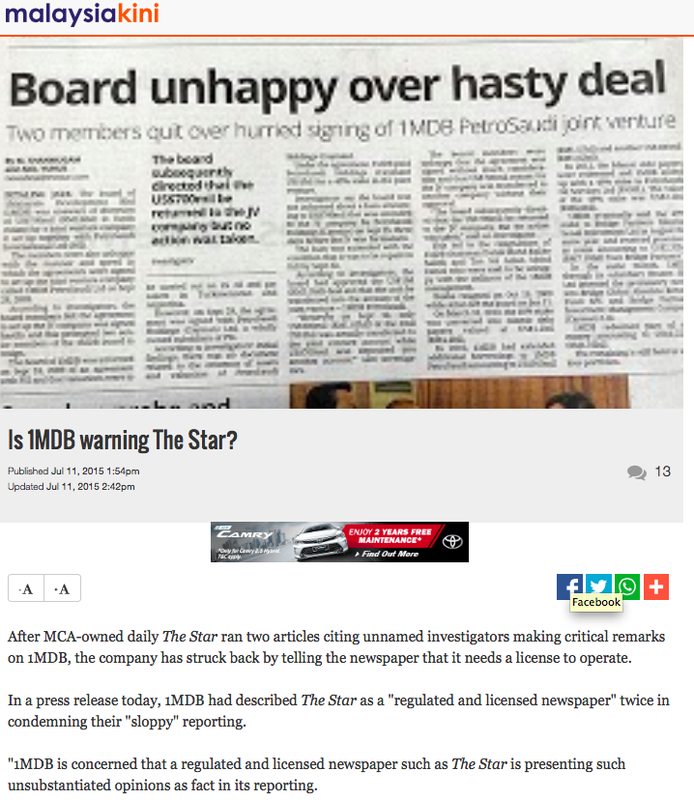 1MDB is concerned that a regulated and licensed newspaper such as The Star is presenting such unsubstantiated opinions as fact in its reporting. Further, it is a well known fact that a number of lawful authorities are conducting investigations on 1MDB and no final determination has yet to be made. For example, The Star states that “Even assets that are being held for sale cannot be easily liquidated”. This is clearly wrong as the notes to the 30.03.2014 financial statements of 1MDB, as audited without qualification by Deloitte, describes how USD1.22 billion (approx. RM 4.6 billion) of these assets had in fact been liquidated and cash proceeds utilised. The Star further states that "there was no document related to the existence of assets and valuation of PetroSaudi Holdings (Cayman)". This is blatantly incorrect. There was a valuation report prepared when the investment was made and 1MDB has in fact submitted the same report to the lawful authorities for their review. 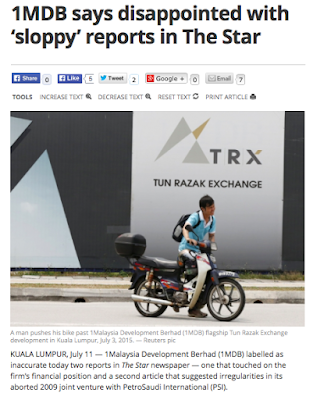 Such sloppy reporting by The Star, a regulated and licensed newspaper, is disappointing. In fact, in relation to the interim report on 1MDB presented on 9 July to the Public Accounts committee (PAC) by the National Audit Department, the PAC Chairman has clearly stated that "there is nothing suspicious in the interim report". It is, therefore, clear there is no truth to allegations that "RM 42 billion" or "RM 16 billion" is missing, an allegation that has been repeated by various parties. A number of lawful authorities are currently conducting investigations into 1MDB. 1MDB is fully cooperating with these investigations. We trust that appropriate measures will be taken by the lawful authorities to ensure the integrity of such investigations. 1MDB can always sue The Star for misreporting. I presume that it (1MDB) has a crack team of lawyers who can do the necessary. So, why complain, when legal remedies are at hand? Incidentally, both the Singapore Straits Times and Business Times papers have been publishing regular reports and commentaries on 1MDB and the controversial WSJ reports. Why haven't these papers been taken to task for their reporting? What kind of state investment company is !MDB when it has to borrow so much that the interest on it was more than a billion dollars or more ? Just look at Tamasek in Singapore their portfolios just released in recently week were well over S$266- billion Singapore dollars. That is the portfolio of a truly investment company they have billions to invest and they do not need to borrow. The year to date the investment company make an annual profit of over 19%, what they make in a year is more enough to cover the deficit Malaysia is facing. May be it is time for Malaysia to send some investment officers to Singapore to learn how to invest. Also another one of reasons why every one in the cabinet is standing right behind Najib is all these cronies have benefited from the US$700- during the election and that is why they are unable to demand Najib to explain fully. What ever the end results are going to be, Najib's rule will surely come to an end at the next election, period. To compound Najib's headaches now it is the wife's accounts in focus, how both Najib and Rosmah can sleep in peace at night is a wonder. That is WCW . The so called self declared Moderate fellow who in actual is a double face scumbag Uktrakiasu DAPig persona . 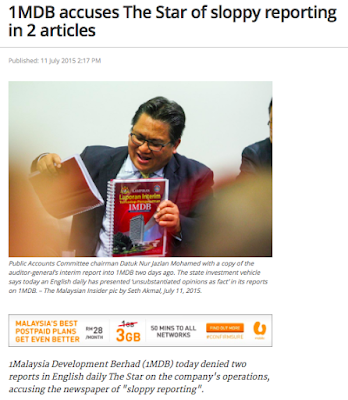 The do called sloppy reporting is in actual an intended reporting with the intention of leading it's reader towards having adverse opinion about 1MDB . It was a clear case that WCW are also using a naive malay in propagating anti islamic thought among it's reader . By the way Dato Rocks, why dont you poll a survey about Dato Seri Najib administration or leadership? Wonder how come the chinese can buy expensive house.condo.car..go holiday to expensive place....buat business haramkah! BANGSA BUMIPUTERA Islam/Melayu mesti BERSATU, utk. MENENTANG habis-habisan puak PENDATANG PENGGANAS-PENGGANAS KAPIRDAJAL DAPBANGKAI/PKRHOMO-EJEN Barat/ZIONIS-PEROMPAK/PENJENAYAH- no 1 - yg. begitu galak tak habis-habis nak MENJATUHkan ISLAM; NEGARA ISLAM pusaka nenek moyang berzaman kita ini; DYMM Kesultanan Islam/Melayu kita sbg. PENJAGA Islam dan kaum Bumiputera; HAK dan IDENTITI Bumiputera Islam/Melayu kita, IMDB/MARA dll, YAB PM Islam/Melayu; DS Mohd. Najib Tun Razak kita serta isteri, DS Rosmah Mansor; dan LEGASI-amat-GEMILANG Ayahanda YAB PM, iaitu BAPA KEMERDEKAAN/BAPA PEMBANGUNAN BUMIPUTERA-no-1, Allahyarham YAB PM Tun Abdul Razak Hussein TERCINTA kita!! IMDB, MARA, TABUNG HAJI, FELDA dan mana-mana insitusi-instusi/pemimipin yg. menjaga HAK dan KEBAJIKAN Bumiputera terutamanya Bumiputera Islam/Melayu memang mahu di JAHANAMkan PENGGANAS-PENGGANAS ANTI-BUMIPUTERA Islam/Melayu ini yang termasuk puak PENGGANAS PEMISAH Sabah/Sarawak, iaitu si KULI-rejim-rejim PENGGANAS Barat/NATO-ISrael/Zionis, yang memang nak MEMISAHkan Sabah/Sarawak yg- kaya minyak/gas, dari Malaysia dan diGABUNGkan dgn. SingaPORK-pusat-CIA-MI6/Mossad/NATO di Asia Tenggara! Sebab itu kita mesti SELAMATkan PULAU PISANG kita yg. sungguh INDAH dan BESAR di JOHOR; dari diJAJAH berulangkali sewenangnya SingaPORK-KEPARAT spt. Batu Puteh – lihat di http://belantan.blogspot.com/2015/07/bimbang-pulau-pisang-senasib-pulau-batu.html, Bimbang Pulau Pisang senasib Pulau Batu Puteh? , Dicatat oleh Taminsari Sabtu, Julai 11, 2015!! Where is Legacy Lim Kok Wing these stormy days? Thought he had taken over from Paul Stadlen the hedonist. Wow..even temasek coffer has to come from somewhere, can't create wealth without borrowing or government backing. Just show us the money. Is it still with this lot in 1MDB or not? If it is, then end of story. If not, then 1MDB should shut up and not talk rubbish! Real question is" WHERE IS THE MONEY?